Anyone spending time in the Souks and squares of the Medina cannot help but be mesmerised by the hustle and bustle of activity. The bright sights of fresh fruit stalls, tempting smells of sizzling tagines and the enthralling sounds of thousands of locals and tourists alike mix together in a cocktail of sensory overload. From this bubbling cauldron of humanity it is a relief to escape into the mountains and experience the serene beauty of the High Atlas. One of the most surprising attributes of the Moroccan peaks is the sheer diversity of scenery in such a compact region. 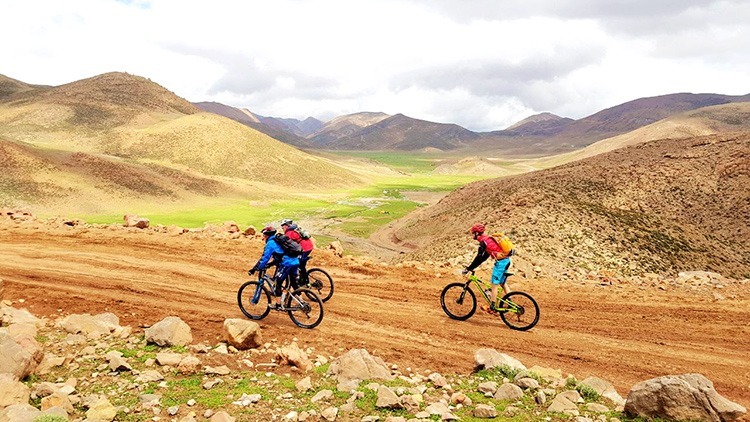 The rideable High Atlas Mountains rise to over 3,000m (the highest peak, Toubkal, soars to over 4,100m) and are a truly alpine environment, with snowy summits and sinuous mountain roads. These heights are separated by deep valleys filled with fertile agricultural land. Riding alongside sedate riverbeds you pass by swaying fields of wheat, orchards of apple trees and small plots overflowing with mint, thyme and other wild herbs. Mud-brick villages are nestled into the countryside with house grafted organically into the hillsides. Children and adults alike greet you with warm smiles and a friendly wave. A culture of friendliness and the welcoming of strangers is alive and well in amongst the Berber people of rural Morocco. The riding is rugged and challenging at times. While much of the distance is covered on dirt roads and jeep tracks, the trails are rocky with long climbs and lengthy thrilling descents. Singletracks made appearance from time to time and these tricky technical trails offered a nice contrast and a test for the more experienced riders. A lightweight full-suspension bike makes the going a lot easier and looks after your body throughout an extended expedition. The support team of smiling drivers, cooks and mechanics make sure that all your food and drink needs are met with locally produced dates, buckets of Moroccan nuts, fresh watermelon and of course a few snickers! Every lunch stop and evening meal our talented cooks whipped up mouth-watering tagines (chicken and lemon was voted the favourite), spiced aubergine stews or any of a number of other incredible signature dishes. 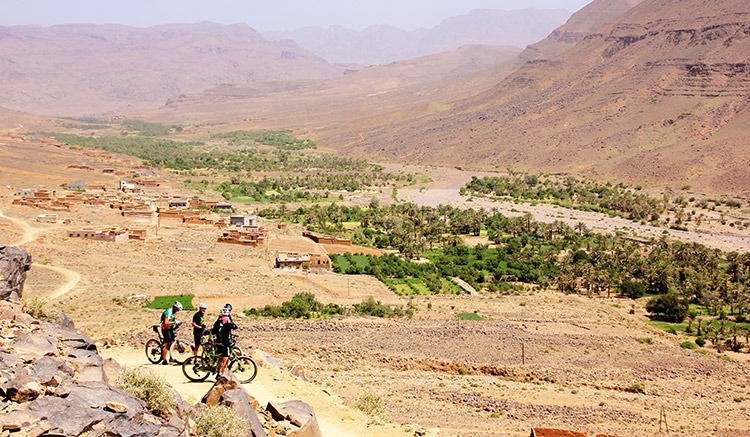 Climbing high over the High Atlas is rewarded by a long descent into the Anti Atlas, the separate and more southerly of the three main mountain ranges. 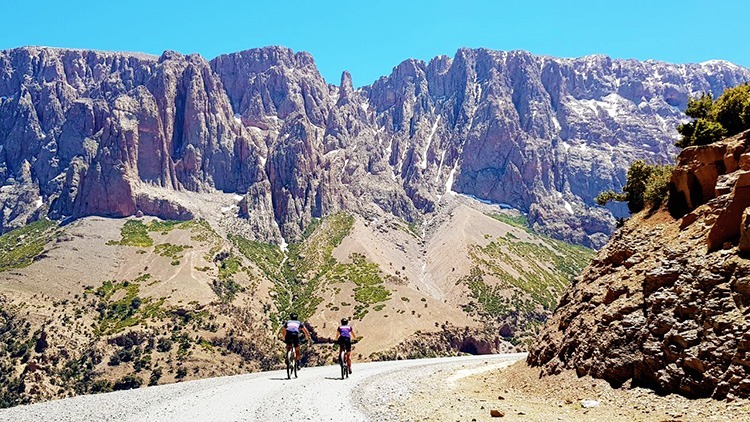 The terrain of the Anti Atlas is markedly different to that of the High Atlas with rockier, more desolate summits and civilisations limited to small hamlets clustered around isolated oases. A wild campsite in this region is a special experience. A post-ride wash in a natural mountain spring followed by kebabs barbequed over an open fire is hard to beat! As dusk falls the silence is only broken by the bleats of the semi-wild herds of goats and perhaps the snores of your weary fellow riders. Heading further south into the formidable Sahara desert completes the transformation of scenery into towering sand dunes below endless blue skies. A final meal gathered around the candle lit dinner table is a fitting way to end a spectacular adventure… with the icing on the cake provided by a night gazing out at the infinite stars while sleeping outside in the warm desert evening. It’s hard to put into words the unique and rewarding experience a week in the mountains of Morocco provides. A simple holiday from a material point of view, but an incredibly fulfilling and enlightening one. Feeling inspired? 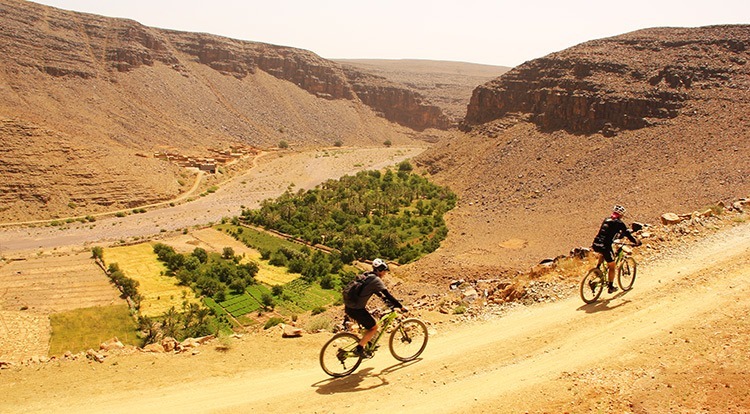 With two mountain biking holidays in Morocco, we’ve some great options for discovering this destination! Check out our High Atlas Traverse trip, a more challenging option, or take a look at Atlas to Desert and get into the very heart of Morocco to explore a variety of landscapes.